NMM 1430. 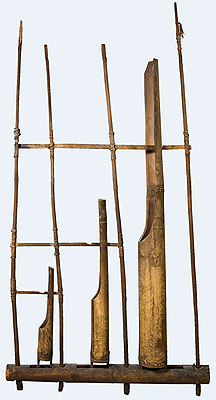 Angklung, Java, 20th century. 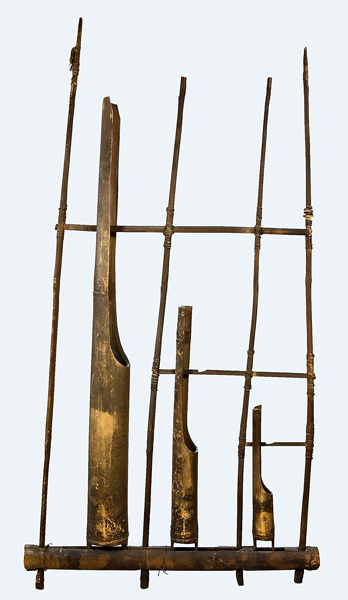 Three bamboo-tube rattles set in a wooden frame. 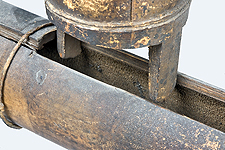 Sound produced when frame is shaken and tubes slide back and forth. Tongue segments cut from the tops of the tubes determine the pitch. 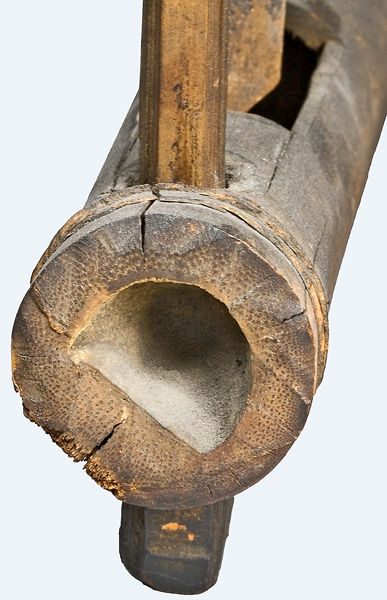 This particular angklung is tuned approximately to the pitch of b/b-flat in three different octaves. Although the angklung is widely distributed across Southeast Asia, it is most prominent in Java. 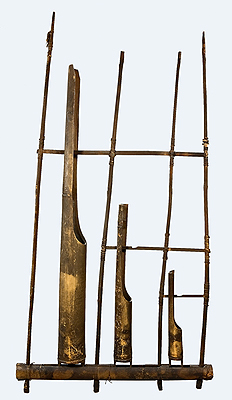 Traditionally played in ensembles with additional angklungs tuned to different pitches; when played together, melodies in five or seven-note tunings are possible. Angklung ensembles may be accompanied by drums and gongs. Board of Trustees, 1976. 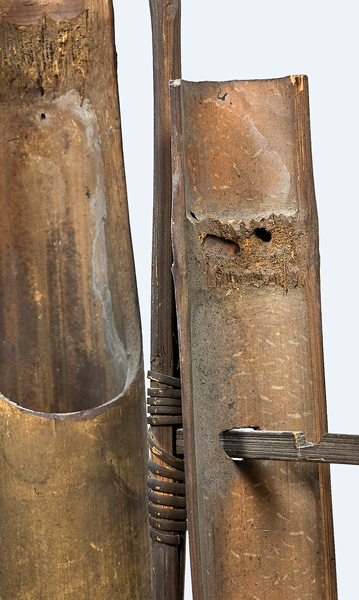 Bamboo tubes cut in half lengthwise at the upper two-thirds; closed at the bottom nodes. Two prongs carved below the nodes. Base formed by binding together two halves of a branch cut in half lengthwise. Overall length: 106 cm. Length of tubes (longest to shortest): 24 cm, 16 cm, 12 cm. Circumference of tubes (longest to shortest): 24 cm, 16 cm, 12 cm. 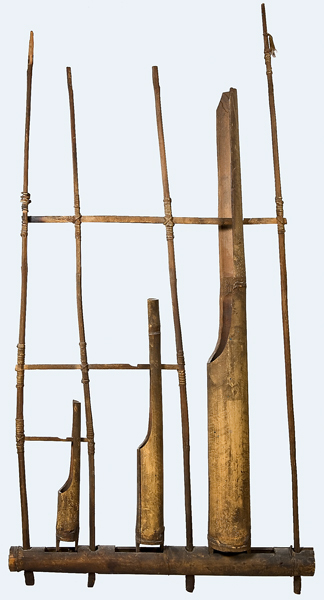 Width of angklung: 47 cm. Angklungs have been integrated into contemporary music-making in Java, where they are played in bands with guitar and drum accompaniment. These bands have replaced the Indonesian five- or seven-note tuning with Western diatonic scales in order to play Western pop music.